Multi-platinum artist Michael Buble grew up near Vancouver, British Columbia, Canada. He was introduced to swing music and old standards by his grandfather, who offered his services for free as a professional plumber to musicians who were willing to let Michael sing a couple of songs with them on stage. He got his big break in show business after former Canadian Prime Minister Brian Mulroney discovered his music. At 10 years of struggling, the discovery came at a time when distraught Michael was considering giving up a career in music and getting a job in media. His performance at a corporate gig in summer 2000 impressed Michael McSweeney, speech writer/right hand man to Brian Mulroney, and told Mcsweeney to feel free to use his independent CD as a coaster if he didn't like it. Mcsweeney gave the CD to Brian & Mila Mulroney, which led to an invitation to sing at their daughter's wedding, where he was introduced to music producer David Foster, who took him under his wing. His self-titled debut album came out February 12, 2003 and has since won several music awards and incredible worldwide success. Five holiday favorites from the EP re-release by this popular Canadian crooner. Features vocal/piano arrangements for: The Christmas Song (Chestnuts Roasting on an Open Fire) - Grown-Up Christmas List - I'll Be Home for Christmas - Let It Snow! Let It Snow! Let It Snow! - White Christmas. The 2013 album by this popular Canadian crooner features the lead single "It's a Beautiful Day" plus a baker's dozen of additional original songs and covers. 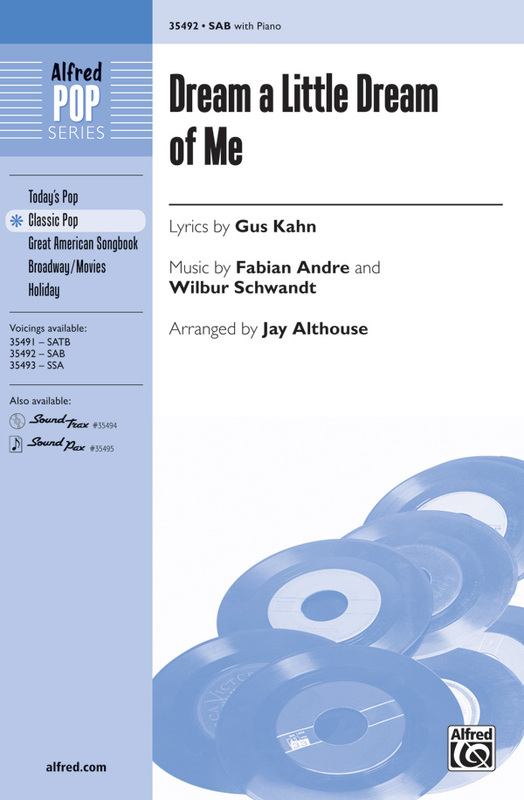 Our folio features vocal/piano arrangements of all the tunes from the album. Piano/vocal arrangements of all 12 tracks from Buble's 2016 release featuring a combination of originals, covers, and pop collaborations! All 13 songs from the major label debut by Michael Buble, a swingin' young Vancouver vocalist and major new talent! He has won several awards, including a Grammy and multiple Juno Awards. His first album reached the top ten in Lebanon, the UK and his home country of Canada, yet achieved only modest chart success in the United States. He found worldwide commercial success with his 2005 album It's Time, and his 2007 album Call Me Irresponsible was an even bigger success, reaching number one on the Canadian album chart, the U.S. Billboard 200 chart, the Australian ARIA Albums Chart and the European charts. Buble has sold more than 20 million albums worldwide. Michael Buble, a swingin' young Vancouver vocalist and major new talent! He has won several awards, including a Grammy and multiple Juno Awards. His first album reached the top ten in Lebanon, the UK and his home country of Canada, yet achieved only modest chart success in the United States. He found worldwide commercial success with his 2005 album It's Time, and his 2007 album Call Me Irresponsible was an even bigger success, reaching number one on the Canadian album chart, the U.S. Billboard 200 chart, the Australian ARIA Albums Chart and the European charts. Buble has sold more than 20 million albums worldwide. This Pro Vocal series contains the lyrics, melody, and chord symbols for eight of his hit songs. The CD contains demos for listening, and then separate backing tracks so you can sing along. The CD is playable on any CD, but it is also enhanced for PC and Mac computer users so you can adjust the recording to any pitch without changing the tempo! Perfect for home rehearsal, parties, auditions, corporate events, and gigs without a backup band. Or for singing just for the fun of it! The 2011 holiday release by this Grammy Award-winning Canadian crooner includes 15 swinging tunes for the Christmas season. Whether you're a karaoke singer or preparing for an audition, the Pro Vocal series is for you. The book contains the lyrics, melody & chord symbols for fifteen hits. The CD contains demos for listening and separate backing tracks so you can sing along. The CD is also enhanced so Mac and PC users can adjust the recording to any pitch without changing the tempo! Perfect for home rehearsal, parties, auditions, corporate events, and gigs without a backup band. Whether you're a karaoke singer or preparing for an audition, the Pro Vocal series is for you! The book contains the lyrics, melody, and chord symbols, and the CD contains demos for listening and separate backing tracks so you can sing along. The CD is playable on any CD player, and also enhanced so Mac & PC users can adjust the recording to any pitch without changing the tempo! Perfect for home rehearsal, parties, auditions, corporate events, and gigs without a backup band. Sing along with 10 tracks from Bublé's hit album: All I Do Is Dream of You - All of Me - At This Moment - Crazy Love - Cry Me a River - Georgia on My Mind - Haven't Met You Yet - Heartache Tonight - Hold On - You're Nobody 'til Somebody Loves You. Grammy- & Juno-winning crooner Michael Bublé describes his fourth studio CD as the ultimate record about the inevitable roller coaster ride of relationships. Our folio features all 13 tunes from this chart-topper, including the Van Morrison-cover title track and: All I Do Is Dream of You - All of Me - At This Moment - Baby (You've Got What It Takes) - Cry Me a River - Georgia on My Mind - Haven't Met You Yet - Heartache Tonight - Hold On - Stardust - Whatever It Takes - You're Nobody 'til Somebody Loves You. 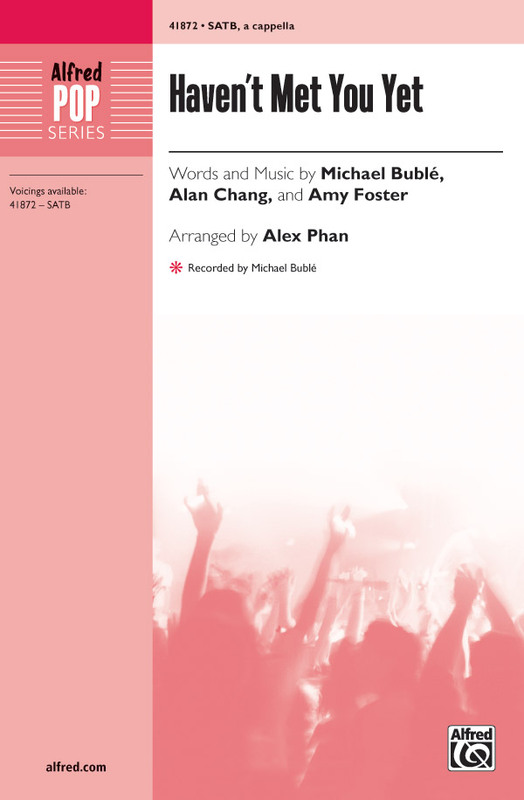 11 songs from Bublé's 10th studio album released in 2018 are presented in this vocal collection with piano accompaniment. Displaying 1-32 of 32 items. Appearing most recently on Michael Bublé's 2010 album Special Delivery, and also performed by Artie in Glee's "Dream On" episode, this timeless song has been recorded by decades of top singers, including Ozzie Nelson, Kate Smith, Doris Day, Bing Crosby, Ella Fitzgerald, Mama Cass Elliott, and Diana Krall. A classic for all ages. Pop and jazz groups will enjoy this smoldering setting of this show-stopping number from the classic 1960s musical by Leslie Bricusse and Anthony Newley, also recently recorded by Michael Bublé. Available separately: SATB, SAB, TTB, ShowTrax CD. Duration: ca. 3:15. Pop and jazz groups will enjoy this smoldering setting of this show-stopping number from the classic 1960s musical by Leslie Bricusse and Anthony Newley, also recently recorded by Michael Bube. Available separately: SATB, SAB, TTB, ShowTrax CD. Duration: ca. 3:15. Michael Buble's upbeat sound and fresh harmonies shine through in this contemporary a cappella setting. Feature a soloist or two over the fun-to-sing vocal accompaniment. Michael Bubléis incredible hit song is now available for your choral groups. 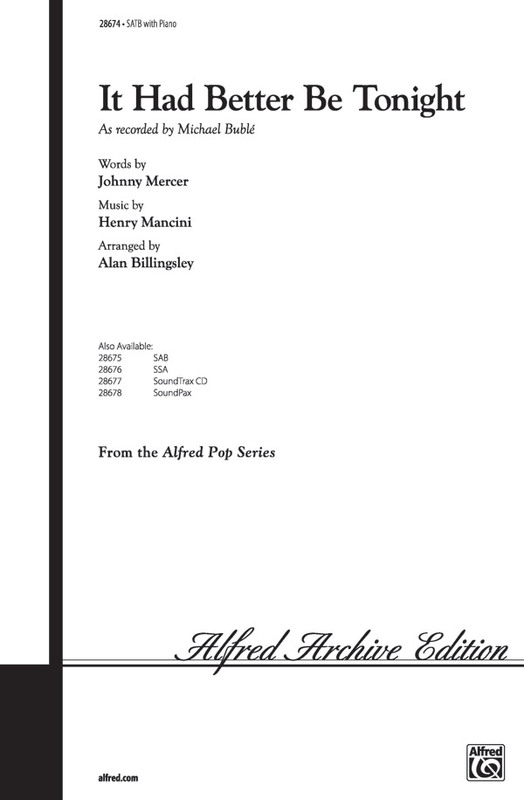 Optional opening solos blossom into a beautiful, heartfelt, and lush choral arrangement. Perfect for spring concerts. The longing for home is a universal human emotion and this #1 adult contemporary chart hit by Michael Bublé expresses the theme perfectly. Known primarily as a singer of standards, this warm pop-style contemporary ballad marks a change of direction for the Canadian heartthrob. A great feature for both concert choirs and pop ensembles. Performance time: Approx. 3:40.Available separately: SATB, SAB, SSA and ShowTrax CD. The longing for home is a universal human emotion and this #1 AC Chart hit by Michael Bublé expresses the theme perfectly. Known primarily as a singer of standards, this warm pop-style contemporary ballad marks a change of direction for the Canadian heartthrob. A great feature for both concert choirs and pop ensembles. Performance time: Approx. 3:40.Available separately: SATB, SAB, SSA and ShowTrax CD. 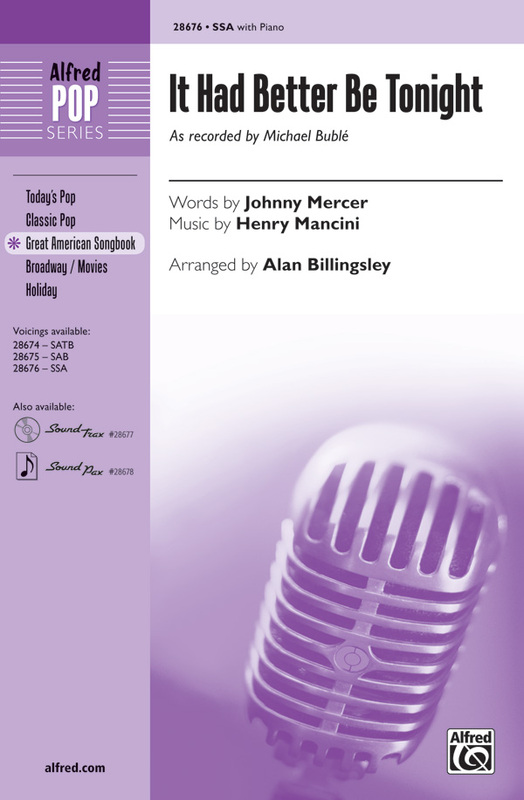 First recorded in 1960 with the Drifters, this classic pop tune has been nicely updated to a smooth Latin style by Michael Bublé to make an excellent showcase for pop, jazz and concert choirs in high school and up. Your group will really shine in performance with this popular Cy Coleman standard recently covered by Michael Bublé and arranged here in a hot swing style. Available separately: SATB, SSA, ShowTrax CD. Rhythm parts available digitally (pno, gtr, b, dm). Duration: ca. 3:40. The theme song for the popular comic book and movie character has been famously recorded by Michael Bublé in a swinging rendition. You don't want to miss this setting that's perfect for pop and show groups! 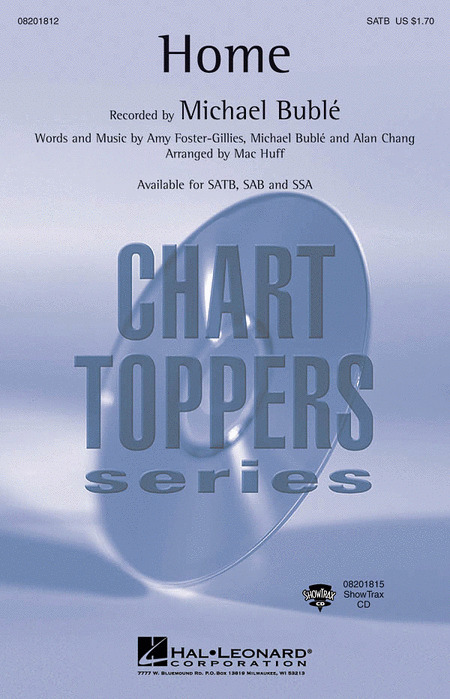 Available separately: SATB, SAB, 2-Part, TBB, ShowTrax CD. Combo parts available digitally (tpt 1, 2, tsx, tbn, gtr, b, dm). Duration: ca. 2:30.